I like Thanksgiving slightly better than Christmas. You get family time without snow, or the pressure of finding the perfect present. Thanksgiving, like Christmas, involves a tasty meal and family visits which leads to doing the deep clean before guests arrive and the turkey goes in the oven. I like Mr. Clean Magic Erasers slightly better than my Swiffer WetJet. That Magic Eraser has save me mucho dollars over the years, especially with a preschooler (yes, it's taken "art" off our walls). This year I'm using Mr. Clean Extra Strength to give my family the cleanest version of my home when they come to visit. I'm using the Magic Eraser to clean sinks in the kitchen and bathroom. 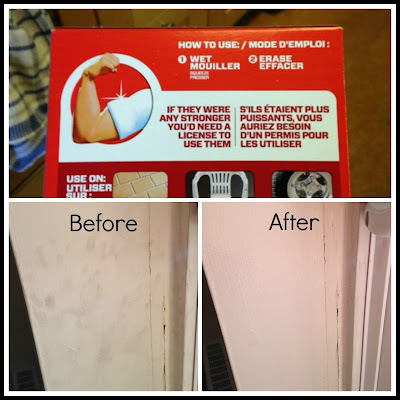 I'm using the Magic Eraser to clean walls and baseboards. And I'm using Mr. Clean Liquid Muscle to do a deep clean of the bathroom too. 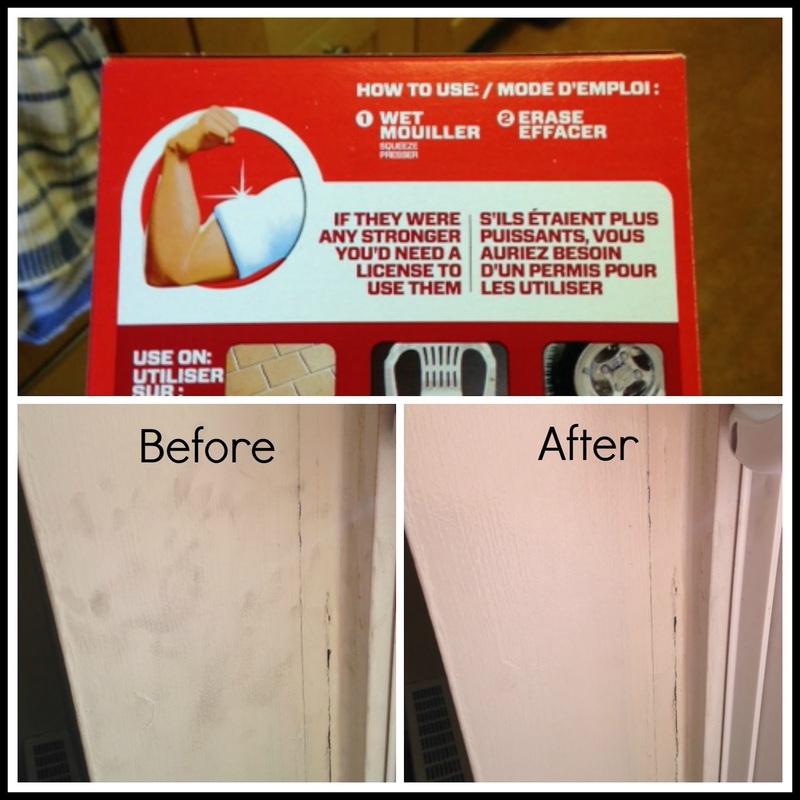 One lucky YYZ Bambina reader will win $50 of Mr. Clean Product (Magic Erasers and Liquid Muscle) and a $50 gift card. P&G has only provided me with the product that I am using as the prizes for this contest. The contest is not otherwise endorsed, designed and/or administered by or associated with P&G.By entering the following contest you are accepting that, if you win, your contact information will be shared with a P&G PR and shipping agency for the purpose of mailing your prize. Please allow 4-6 weeks from the contest closure date to receive your prize. Enter using the Rafflecopter by October 25th, 2015. I always do a quick clean/organization the day of, and always have the bathroom clean! I prepare by doing major house cleaning. I make sure the bathrooms and kitchen are spotless! I do a clean sweep of the house, lots of scrubbing and carpet cleaning! I prepare by cleaning the entire house, moving furniture, getting the guest towels out, etc. I prepare for holiday guests by cleaning the different rooms that the guests will be in and putting up decorations around the house to make it look festive. I empty the garbages, refresh the washrooms, try to vacuum and sweep up all the fur and put on the scentsy. I will give a good tidying up to the house especially the bathrooms. I give everything a wipe down with cleaning wipes! I clean my house top to bottom and make sure to have lots of food! I clean like mad! Especially the kitchen and bathroom. I like to vacuum and make sure everything in the house is tidied up. I clean the house really good. I have a maid come in and help me clean the house so I can work on everything else that needs to be done. I clean the house up thoroughly ahead of time then just have to quick cleanups. I just roll up my sleeves and start cleaning. Luckily my family is pretty laid back so it really doesn't matter. Decorate, cook and thoroughly clean ahead of time. I help to prepare the holiday guests by cleaning bathrooms, vacuuming, dusting, etc. It seems to be the only time the house gets a thorough clean is when guests are coming! Bailey Dexter I always do every sat morning the whole house both floors, even the pictures as well as the ceiling fans. When guests are coming over to the house it just a quick touch up with my two favorites Mr Clean sponge and baby wipes. What one does not get the other cleans up! This way I am not running at the last min to to clean but to relax & cook! We do a big blean of the house then make sure the table is all set before anyone arrives. 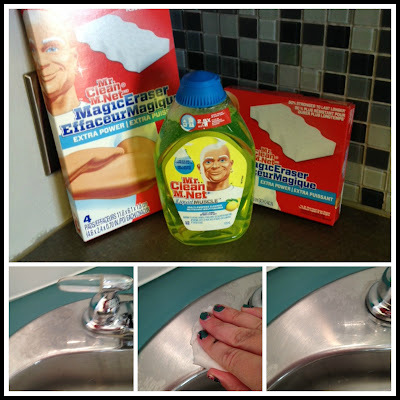 It would be great to win $50 of Mr. Clean Products and a $50 gift card. by washing the floors, cleaning the bathroom and cooking lots of food. I clean. set table and prepare dessert in advance. That leaves me lot of time to prepare the main meal. I Prepare For Holiday Guest By Cleaning, Add Festive Decor And Stock Up On Food And Drinks. I prepare by cleaning the house, adding festive decorations, do some grocery shopping, and make sure all the dog toys are put away. I do a thorough clean of the house and do all my food prep the night before! I thooroughly clean the house & I tidy eveything. I cook ahead of time. We do extra cleaning when we get holiday guests. Ensure light switches and doors are clean. These are often missed otherwise. I start prepping the weekend before in terms of cleaning, and don't leave the prep until the last minute. I prepare by cooking and tidying up. I clean the house and cook. I start preparing everything that I can ahead of time because there`s still always lots that still needs to be done. I clean the main rooms of the house, concentrating on the bathroom & living room. And make sure to have cooked most of the food so I can visit with guests instead of being in the kitchen the whole time. I prepare for holiday guests by cleaning, making sure I have the food I need and preparing any dishes I can ahead of time. I clean daily,but clean even more extra when I am expecting company or on special holidays. The oven gets a good going over. Make a to do list so nothing is forgotten. Do as much prep work ahead as possible. I get out extra fresh towels, vacuum well and dust. Plan a simple but great meal. I like to pre-set the table. I wrap the presents as I get them so I'm not left with that when I am trying to get the house tidied up. I clean the bathrooms and spare bedroom. I clean the house and stock the fridge and pantry with plenty of food to serve everyone. I clean the heck out of the bathroom. Not too much extra, maybe a special cleaning of the bathrooms. And lots of cooking! Definitely do a big clean up and turn on the air purifier. I like to make the guest room as comfy as I can. I clean everything, and make lots of cookies. Clean and cook like crazy! I clean the whole house, change sheets, and get groceries in. Shampoo the pet hair out of the carpets, clean the bathrooms and kitchen! I just do a good house cleaning and prepare as much food before they get there as possible! I clean, especially the guest bathroom. I also cook/bake things they like. Aside from the deep cleaning, about 15mins before guests arrive I fill a washpan with hot water add some mr Clean and do a wipedown of the counters and walls for a fresh smelling home! I dust my home top to bottom and wash windows! I clean especially the kitchen and bathroom. We do a whole house clean including new air fresheners in the bathrooms. I give the whole house a good cleaning and then change the bedding in the spare room in case anyone stays over. I prep food, clean the house, organize! I give myself a day to get ready and have someone come over and help clean! i do complete detailed clean up my house to prepare for holidays. I clean the house and make sure I have all the food I need in the fridge and freezer. I do a quick clean during weekdays. Weekends I clean fully. I usually prepare by making some foods ahead of time and making sure the house is clean. I try to clean, when I can find time! Clean up the house and decorate! Always clean the washrooms and try and get fresh flowers! I like to do a deep clean of the place and make sure I have some nice smelling candles. We break down the chores and get them done a not at a time the week before guests arrive. I over clean my house to prepare for guests. I tend to overdo it when it comes to cleaning. I clean the house (especially the areas guests will be spending time in). I air out the house and make sure there are plenty of drinks and snacks on hand! First thing I do for Holiday guests is clean the clutter put away all the papers stuff that seems to collect then clean the bathroom.